To march forward in quick time from a halt, the command is Forward, MARCH. On the command MARCH, the airman smartly steps off straight ahead with the left foot, taking a 24-inch step (measured from heel to heel), and places the heel on the ground first. 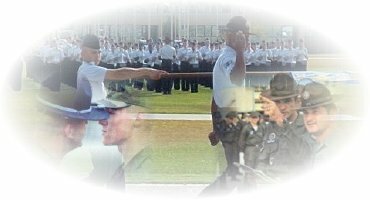 When stepping off and while marching, the airman will use coordinated arm swing; that is, right arm forward with the left leg and left arm forward with the right leg. The hands will be cupped with the thumbs pointed down. The arms will hang straight, but not stiff, and will swing naturally. The swing of the arms will measure 6 inches to the front (measured from the rear of the hand to the front of the thigh) and 3 inches to the rear (measured from the front of the hand to the back of the thigh). If applicable, proper dress, cover, interval, and distance will be maintained. Proper cadence will be adhered to. Count cadence as follows: counts one and three are given as the heel of the left foot strikes the ground, and counts two and four are given as the heel of the right foot strikes the ground. To halt from quick time, the command is Flight, HALT, given as either foot strikes the ground. On the command HALT, the airman will take one more 24-inch step. Next, the trailing foot will be brought smartly alongside the front foot. The heels will be together, on line, and form a 45-degree angle. Coordinated arm swing will cease as the weight of the body shifts to the leading foot when halting.